Preheat oven to 425° F. Unfold thawed puff pastry and cut along creases creating 6 rectangular pieces. Place strips on a lightly greased baking sheet and bake for 10 minutes or until golden brown. While those cook, combine sugar and cinnamon. Remove pastry from oven. One by one, dip each piece into the melted butter, and then dredge in cinnamon sugar. Place on cooling rack and allow to dry for 5 minutes. Tie a ribbon around and wish your graduate congrats! Cut smaller rectangles for smaller diplomas. It's graduation time! 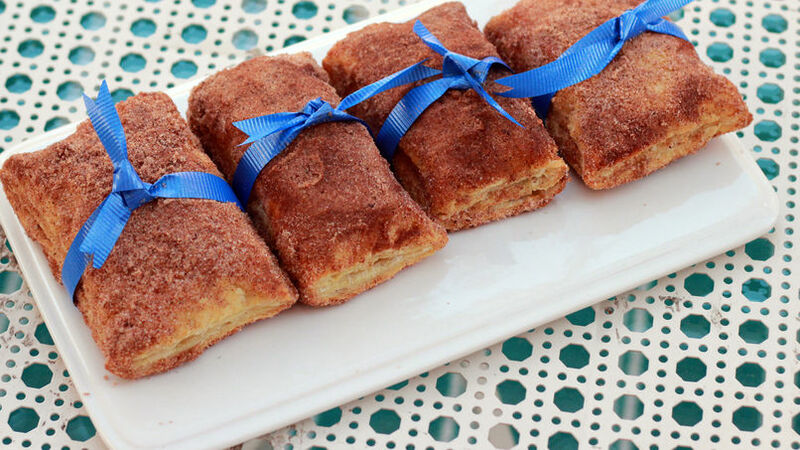 And who doesn't love the sugar and cinnamon goodness of a churro? This Baked Churro Diploma is a fun graduation food idea that skips the deep fryer but not the flavor.